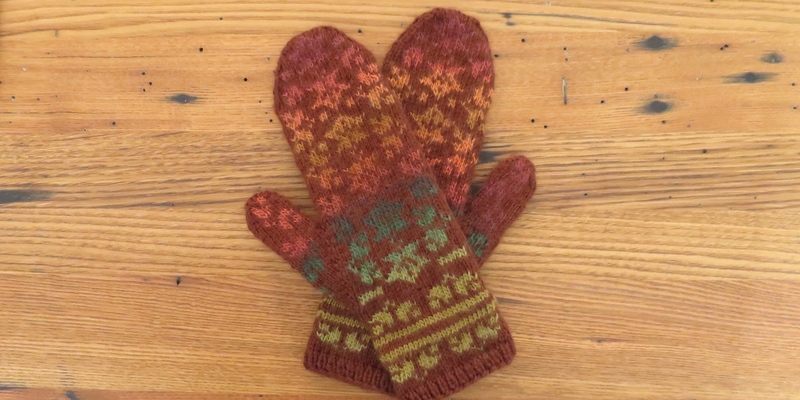 Our mittens for September are inspired by the colors of the fall leaves, greens, golds, reds, and even purples. I used self-striping yarn in fall colors to make the colors of the leaves blend from one to the next. The yarn I used was Red Heart Unforgettable in Polo. Now, this yarn claims to be worsted weight, but it is no where near. I found it to be closest to sport weight and, after looking at reviews on Ravelry, a lot of people agree with that. I tried pretty hard to make the color changes match on both mittens by starting in the same place in the change cycle on each mitten. It wasn’t exact, but close enough. I also cut out a large section of brown and dark green from the yarn because it was too close to the brown background color. Download a pdf of the Falling Leaves Mittens Pattern with Chart or just the Falling Leaves Mittens Chart. Follow chart for color pattern. Both hands are knit identically. Cast on 52 stitches. Divide between three needles. Join to knit in the round placing a stitch marker between the first and last stitch to mark rows. Row 31: k27, m1l, k2, m1r, k27 (58 stitches) Place stitch markers before the first m1 and after the second if you wish. Cut yarn leaving about a 10 – 12” tail. Seam shut with Kitchener stitch. Weave in ends. Put the 22 stitches on the scrap yarn on three needles. 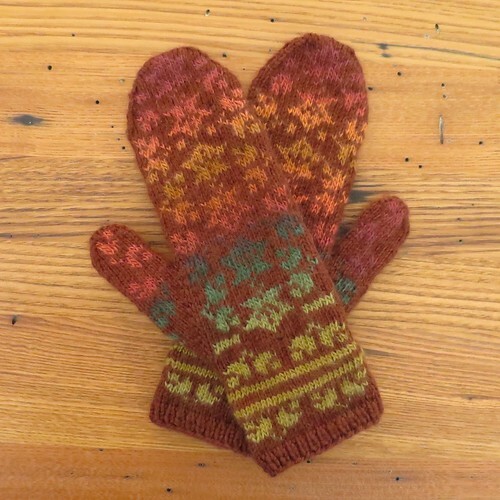 Pick up a stitch from the hand on the mitten. Place a stitch marker between the picked-up stitch and the next stitch to mark rows. Cut yarn leaving about a 10” tail. Seam shut with Kitchener stitch. Weave in ends. 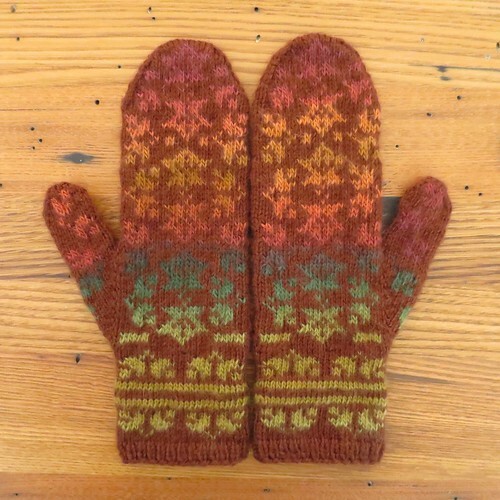 I like that the mittens don’t exactly match, seems more like falling autumn leaves. Nice job! Me too though too far off looked a little wonky in my eye so I kept it close. Thanks, I’ve been wanting to try the whole self-striping yarn thing for awhile. Another beautiful set of mittens! I am starting to see some of the colors changing now, but not yet falling. I love these best of all, wonky or not! What do you do with all your mittens? These are beautiful. If you hadn’t mentioned it, I wouldn’t have noticed the difference between the two. Excellent! These are absolutely beautiful. Love the pattern and the color combination. You could send some mittens to the Cheyenne River Resrrvation. They are having a mittens-hats-n-socks drive right now. Heat-the-Feet! Help! As of row 29, I have 56 stitches but the chart only has 54 stitches. What did I do wrong? Row 29 is the start of the thumb, which is off to the side of the chart, you’ll see it is two stitches. In row 31, I suggest you put stitch markers on either side of the make 1’s to help you remember this area is the thumb and that you need too look at the thumb chart.